Despite losing out on the trophy on Tuesday 21st August, our Lifeboat Team throughly enjoyed the afternoon and had a lot of supporters to (quietly) cheer them on. Although they won 9 ends each, their opponents had one really good end putting our ladies into the runners up spot. As you can see below, they are still smiling. Well done ladies. Our annual invitation day on Sunday 19 August went extremely well with 24 teams competing for the trophy. Although the weather was a little overcast, it did not interrupt the day and, hopefully, did not affect the enjoyment of those taking part. 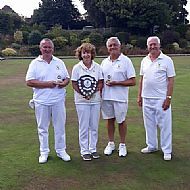 We were pleased to welcome some old friends and some new friends, as well as last year’s winners, The Three Amigos, from Portslade Bowls Club who returned to defend their title. 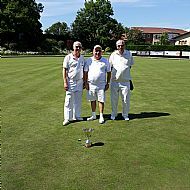 After all the teams playing 5 games, the third/fourth place play off was between Wrong Bias from Eastbourne Bowling Club and The Three Amigos, with the latter coming out as victors and claiming the third place. 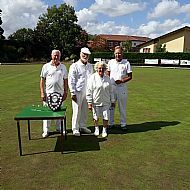 The final was between This Time from Uckfield Bowling Club and Bowls-R-Us from Seaford Bowls Club, again with the latter coming out as winners and so taking the trophy and the former taking second place. The prizes and the trophy were presented by Jaimie Bateley from our Sponsors, Waitrose whose generous support was greatly appreciated. A big thank you must go to all those who helped on the day, too many to mention individually, but particular mention must go to Wendy Ryan and her catering team who did a wonderful job preparing and serving some 100 lunches and afternoon teas. Well done to you all. There were a lot of fun and frolics on the green today, August 18th, when we played the touring side Fosseway. A slight smattering of rain sent several bowlers running for wet gear, but it soon passed and we played on in slightly windy but warm conditions. We had a superb treat after tea which bought the whole green to a stand still, when an amazingly close flypast by the Lancaster Bomber on it's way to Airbourne caught everyones attention. Well arranged Eddie! Fosseway was most impressed! Although we came second, a funtastic day was had by all. Gaynor, Dave, Chris and Ian from Fosseway (photo above) had to pay a penalty as they were on the lowest scoring rink, which caused a lot of amusment for all of us! Thank you to all involved for making it a great afternoon. Norma Dalgleish, Doreen Ryall and Kathy Pease weathered the storm this afternoon and sailed through the Lifeboat Triples semi-finals. They are on board again tomorrow afternoon to play the Finals and we wish them favourable winds and sunny skies. Anchors away ladies! Have a wonderful day. After torrential rain during the previous couple of days, it was touch and go as to whether the Ken Ryall would be played, but after the amazing efforts of a wonderful early morning "let's get this show started" team, the day went ahead in mostly beautiful sunshine. All twelve pairs played four games each of six ends with the top four pairs going through to the semi finals. Sally and Keith Pulling beat Norma and Tom Dalgleish and Jo and John Brand pushed Jenny and Bobby Bennett in to an extra end to take the win. After a day playing 36 ends of quite tough bowling on a heavy green, Sally and Keith managed to win against Jo and John. The trophies were presented by Dorreen Ryall. The competitors would like to say a huge thank you for all the hard work that was put in to make this day happen. 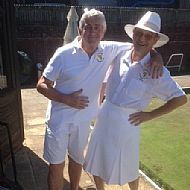 Our two new 'Lady member's from our Ladies versus Gents bowls day. Goldie Hawn & Michaela. After weeks of no rain, overnight heavy showers caused Competition Secretary Pat Smith some cause for concern, but Saturday 28th July dawned fine but breezy for the playing of the Bob Price Shield. Eleven teams played some excellent games in the opening rounds with several newcomers showing their skill. By the Semi Finals the wind had increased considerably and affected the running of the bowls especially the smaller ones but the trios of Doreen Ryall, John Brand and Peter Langford together with Mike Cooke, Jo Brand and Paul Speller overcame the conditions to fight a close final with Mike, Jo and Paul coming from behind to win on the last end. 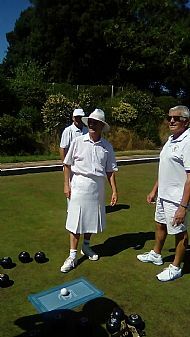 “A very hot 30th June brought 12 ladies together to contest the Harris Bowl. They endured the heat very well all playing a minimum of 18 ends. The finalists were Wendy Ryan and Norma Dalgleish – a close run match with scores level going into the last end, but Wendy prevailed by 2 shots. 14 pairs competed for this year’s Simmons Cup under a clear blue sky & very warm sunshine. A very dry and fast green made control of the bowls a challenge resulting in some close finishes in the round robin section. Pat Smith & Norma Dalgleish took on Frances Baker & Graeme McKinnon over 6 ends in the final with the latter pair winning on the last end. Progress in the men's National and Sussex County competitions came to an end on the 20th June with a defeat at Eastbourne Saffrons BC. The Abergavenny competition had started well on the 13th June with a fine victory over White Rock in the first round, and our men put in a great performance, winning by 40-30. However, luck didn't go our way in the National Top Club and Double Fours competitions with defeats at Gildredge Park and Spartan and Lakeside respectively. Well done lads and thank you for all the effort put into the matches. 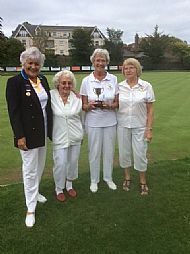 Heartiest congratulations to the ladies who keep marching on in The Gladys Rowland Trophy Competition, with 3 fantastic wins at bowling clubs far and wide in Brighton and Littlehampton. What a fabulous achievement girls. We are all so proud of you. Keep up the good work and fly the Hailsham flag right up to the County Final. On the domestic friendly match scene, the club has a 50% win rate and 50% loss in May and June. However, some of the losses have been very narrow and the matches have been very enjoyable. Lots more club competitions and matches to come throughout the next few months for everyone to enjoy. The sun shone brightly on the green as we hosted 5 local visiting teams, pitting their bowling skills against our ladies. We started off with a Spider for a bottle of Prosecco which was won by a former Hailsham bowler Shelagh Allen who went on to win the visitors prize with her team from Hellingly Bowls Club, our victors were Jo Brand, Rita Smith and Avis Green. As always, our ladies came up trumps and contributed a wide variety of delicious savoury and sweet foods, which judging by the feed-back and empty plates, was a great success. Many thanks to all our members who helped set up the greens etc and our fabulous kitchen helpers both ladies and gents, you are all Stars, l include in that our balloon blower upper!!! 24 players competed for the Comerford Trophy Men’s Singles Competition on Saturday 2nd June in fine weather. 5 new members including 4 of this season’s new players were welcomed and enjoyed their first taste of competitive bowling at the Club. There were some close finishes in the group stages and the Final was won by William Wheeler against Bobby Bennett. Our Chairman Steve Carter spoke a few words about Jim Comerford after whom the Trophy is named and presented it to the winner. A warm sunny day welcomed the 24 gentleman arriving to play in this years Comerford Trophy, which was a great relief to our competiton secretary Pat Smith after last years downpour. We had a good fun day out at The Parade Eastbourne today. The sun shone, relentlessly, and after 35 ends we were all pleased to sit down to tea and cakes. Saturday 23 September saw the final competition of the season – the Simmons Cup. All proceeds from entry fees & raffle were donated to our chosen Charity which this year is St Wilfrid’s Hospice. A magnificent donation of £271.35 will be presented on 11 October to representatives of the Hospice. The Competition saw some varying results in the group stages with matches going to the last wood of the last end to gain a draw to a complete “whitewash”. In the Final Keith Pulling & Dave Ellis were narrowly beaten by William Wheeler & Wendy Ryan. The Trophy was presented by the Chairman Pat Smith who wished all members good luck during the Winter & looked forward to seeing everyone next season. The certificate was presented to the club by Anthony Statham who explained what Clubmark is and how we are the first bowling club in Wealden, and only the seventh in the whole of Sussex, to achieve Clubmark status. Following the presentation, Councillor Hardy and Councillor Coltman both gave short speeches expressing their congratulations to the club on this achievement and expressing their respective council’s ongoing support for the club. The presentation took place immediately preceding the playing of the Simmons Cup, which this year coincided with our charity day in aid of St Wilfrid’s Hospice, and it was encouraging to see so many members present at the presentation. Thank you Goldie (Richard Goldsmith) and Chris Andrews for the photos. Click on the link below to see more of their photographs. The early arrivals were treated to our two singles winners Christine Andrews and Peter Baker, playing The Champions of Champions, which after a close start Peter went on to win. The BBQ was then fired up by the BBQ Belles who cooked burgers, sausages and onions which were nestled in to buns to accompany fluffy jacket potatoes topped with cheese, all served with a salad garnish. Delicious. The very busy bar was manned by Eddie and several of the more energetic bowlers took the opportunity to embrace the music and a lively conga was danced around the green. Which warmed them up nicely for the main event of the evening. Despite the ever increasing wind and threat of rain, a very large competitive field of bowlers formed two orderly lines (after a lot of jostling for an early roll) to aim bowls down the candle lit runway at Peter and Derek’s torchlit jacks. All calls for measures were studiously ignored, whittling the players down so eventually Jenny Bennett and Dave Sykes were left to battle it out for the honour of Candle Lit Champion 2017. In a gripping final, Jenny was edged out so this prestigious award was won by Dave. Then the rain arrived, snuffing out the candles that the wind had missed. Many thanks to all of you who supported this fun evening and especially to those who made it happen. A thunder storm failed to dampen the spirits of the 24 members who entered this year’s competition. It was encouraging to see 2 of this year’s new members and several of last year’s new recruits taking part. When play began the green was dry and bowled really well thanks to the efforts of “assistant” green keepers George and Peter. 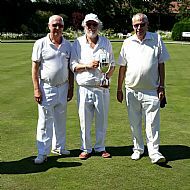 There was some good bowling resulting in a close final between one of last year’s newcomers Mike Cooke and the very experienced Fred Stevens with Fred winning the Trophy by one shot. Shown below are photographs of some of the work being undertaken by members to prepare the club (clubhouse, changing rooms, green, etc.) for the coming 2017 season. There are other members who have helped who do not appear in these photographs. It should be noted that thanks go to all those members who have helped in any way (and at the time of writing there is still some work to do and I know that even more members will be involved in the internal cleaning, etc. during week commencing 17 April), and a special mention of those members who have stepped up to help in the preparation of the geren following Alan's recent mobility problems. All pictures on the site were taken by club members and thanks go to all those who have provided the pictures.